In addition to making a societal impact, a family foundation can unify the family and create an enduring legacy — if the foundation is well run. Few would argue that vision and discipline are essential to make money in a family business. The same ingenuity is needed to donate money in a way that feels right to all family members. As family businesses achieve significant wealth for their owners, philanthropy tends to become increasingly important to the family. Many factors spark the interest, including a desire to give back to the community that supported the business, passion for a particular cause and the hope of doing meaningful work together as a family. Yet the same relationship issues that affect the business also impede a family’s charitable pursuits. The Root Family Foundation, based in Ormond Beach, Fla., had to overcome hurdles when the last of the third generation, Susan Spear Root Feibleman, died three years ago. The family’s original business, Root Glass Company, designed the first Coca-Cola bottle in 1916 and made canning jars. 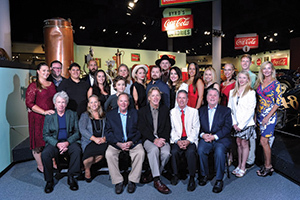 After the glass company was sold to the Mason Co. in the 1930s, the family operated a Coca-Cola bottling business until 1985 and then invested in such diverse fields as hospitality, aviation and citrus. Since 1992, the family enterprise has focused on commercial real estate. Although the Root Family Foundation dates from before the turn of the 20th century, few family members had roles until the century neared its end. But when Feibleman’s descendants inherited leadership of the foundation, they faced a new set of decisions. “My mother’s estate expanded the foundation a great deal, so it was a challenge of establishing our vision versus the vision of our ancestors, [as well as] the administration of a foundation that was approximately eight times bigger,” Root says. Previous generations took the “give and go” approach, simply granting money to one charity or another. Today, Root family members are directly involved with the charities the foundation supports — organizations serving children and families with critical needs, such as medical issues, the loss of a parent, hunger and homelessness. The G5s ultimately resolved the issue on their own a few years ago. They developed an innovative video grant-application initiative. Organizations that are invited to apply for grants fill out a one-page form, supplemented by a video they can shoot with a smartphone. The family goes online to view and vote on the proposals. “It’s a way to connect people with the [organizations’] stories, but also to involve G5 and for us to support the organizations G5s are connected with,” says Root. The videos, he explains, depict “real people and real emotions.” For example, a facility seeking funds to refurbish its kitchen could make a video showing what its current kitchen looks like, juxtaposed with plans for the renovation. Family foundations are on the rise. According to the Foundation Center in Washington, D.C., there were 42,008 family foundations in the United States in 2014, a 9% increase over the number in 2010. Giving by family foundations has been increasing since 2002, with only a very slight dip during the recession in 2009 and 2010; the uptick resumed in 2011. Of the $52 billion given away by U.S. charitable foundations in 2014, nearly half — $25.9 billion — was given by family foundations. A well-run family foundation can be more than just a vehicle for making a societal impact. It also can be a unifying force for family members and a way to create an enduring family legacy. The Tracy family, which owns Dot Foods, the largest food industry redistributor in the U.S., decided to create a foundation in late 1995/early 1996. The company, founded in 1960, today delivers 112,000 products from more than 830 manufacturers to distributors in all 50 states and more than 25 countries. The Tracy Family Foundation was formally established in April 1997. “We feel very blessed as a family and a family business, and we wanted to take the morals and values of the founding members of the family and give back to our communities,” says third-generation member Lauren Tracy, 37, a member of the foundation’s board and senior business development manager at Dot Foods. “Everyone had the opportunity to voice an opinion,” says Tracy. 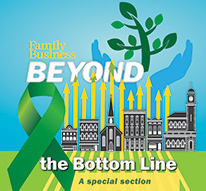 “We had sessions where the family could talk about what means a lot to them.” Through this process, the family determined the foundation’s focus areas: education, youth and family, leadership, and economic development in the Brown County, Ill., region (where the family business is headquartered). A family and its business can make a philanthropic impact without a foundation. But a family foundation provides considerable benefits for those who have a substantial amount of money to give away. Some of those advantages are financial. The foundation structure can offer savings on estate and capital gains taxes, in addition to salaries for family members who work for the foundation. There are other benefits, as well. A foundation gives a family control over how their charitable dollars will be spent (compared with giving the money to a charity that determines the use of the funds). It provides a vehicle for family members to work together. And it can serve as a training ground for next-generation members on a range of topics, such as finance, governance and, of course, the family values. A family must weigh those advantages against the costs. Starting up a foundation involves legal and accounting fees, plus other expenses. Most private foundations are subject to federal excise taxes. Staffing and other overhead costs must also be factored in, and the foundation must comply with recordkeeping, annual reporting and regulatory requirements. Many families have opted to establish a donor-advised fund (a tax-advantaged investment strategy that benefits a charitable organization) in lieu of a foundation to save on overhead expenses and avoid regulatory filings. What can tip the balance in favor of establishing a foundation is the discipline the structure provides, which helps ensure a lasting entity — “something tangible around which the family can gather for generations,” says Lindsay Matush, CEO of Vario Philanthropy, a St. Louis-based consulting and management firm. A foundation — with its attendant reporting requirements — provides a degree of formality, predictability and consistency, as well as a rallying point for current and future generations, Matush says. A clear mission statement helps a family determine where their charitable dollars would make the biggest impact, Matush notes. Should the foundation make a grant to an established organization run by an old classmate of the patriarch, or would it be better to fund a startup charity suggested by a next-generation member? Assessing how each of the two options fits in with the mission makes the decision seem objective, rather than a disagreement between two family members. A mission statement should be specific, Matush says. Families who want to fund education, for example, should consider what kind of education they want to support: Local or global? Urban or rural? Early childhood? Special needs? Decide on the impact your family wants to achieve and then determine how you will measure that impact, Matush advises. Such a thought process helps your family identify which organizations should receive funding — i.e., those that are best able to achieve the desired result. For example, consider a family foundation that wants to help students who are the first in their families to attend college. The family might brainstorm about what these students need—community role models, funding for college visits, SAT tutoring and the like. Organizations that can fulfill these needs would be good candidates for funding from the foundation. “I think it’s important for families to spend time developing focus areas — what they want to support — and what that looks like, to be very clear if a grant is good fit for the funding model,” says Tracy. 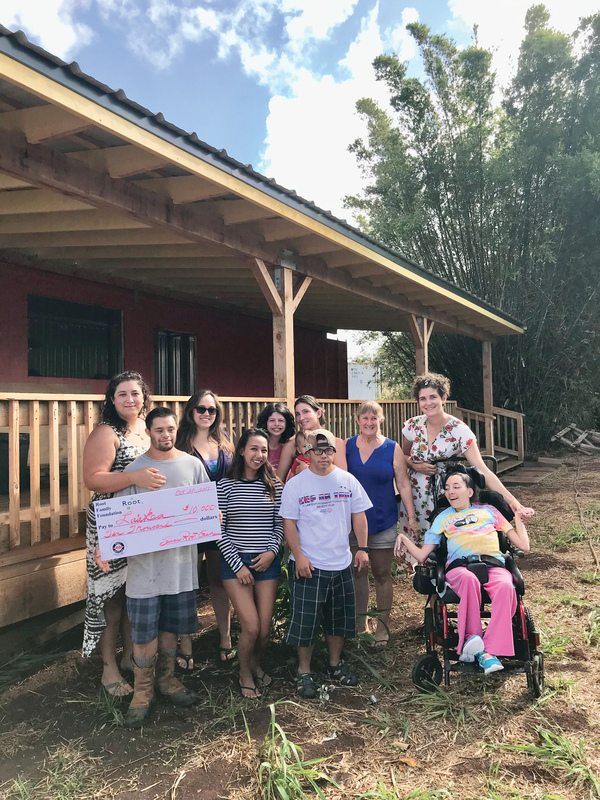 For the Tracy Family Foundation, she says, “It’s been an evolution of starting very small and identifying our focus areas, then growing and determining together as a family if we want to be proactive or reactive in how we fund programs,” for example, deciding whether the foundation should partner with other agencies. The Root Family Foundation has altered its mission over time to reflect the evolving interests of family members and changing societal needs. From evidence uncovered in old records, the family estimates that Chapman J. Root, who founded the business in Terre Haute, Ind., started a formal program of giving in the region around 1885. The Root family is widespread now, and members want to make an impact in communities where they live. “My job as president is to mold an organization that provides outcome-based results and builds camaraderie, capacity and caring internally within the family,” Root says. Root says his family has not fought over funding. There have been disagreements, but they have been resolved through “compromise, creativity and patience,” he says. “One of the things we learned as a family foundation is that ‘no’ doesn’t mean ‘never,’ it just means ‘not right now,’ ” Root says. Good governance is essential to ensure the foundation will fulfill its mission and will not perpetuate dysfunctional family dynamics. A family foundation should be taken seriously; it should not be used as a dumping ground for underperforming family members, Matush cautions. “While nobody says, ‘I am going to start a foundation so crazy Uncle Joe has a place to work where he can’t damage the business,’ it doesn’t mean the thought isn’t there,” she says. Often, it’s a next-generation member who’s assigned a role that he or she is unfit to fill. Parents appoint children to foundation positions to give them a paycheck, make up for parental absences when the kids were young or attempt to rehabilitate offspring who were spoiled while growing up. • What values do you plan to express through your giving? • Do you wish to involve others (extended family, employees)? To what extent? • What is the geographic scope of your philanthropy? • How long do you want your philanthropy to operate? Years? Decades? Forever? • Do you prefer supporting others’ work or hands-on participation? • To what degree are you comfortable delegating tasks (such as investment management or correspondence)? • How much time can you devote to administering your philanthropy? • What are the tax consequences? • Directors have term limits. • Expectations for directors (such as time and travel commitments) are made clear up front. • The board meets face-to-face — preferably in person, but through videoconferencing if necessary. • There is strong internal communication and onboarding for new directors. • There are ways to engage family members who don’t serve on the board. • Family members receive ongoing education in the giving area. • There are opportunities to celebrate achievements and engage the whole family. A foundation should be a vehicle for proactively passing down family values, not a reactive fix, Matush says. “If a child is spoiled, self-centered and irresponsible with their own assets, they’re likely to be so with foundation assets, and disinterested in foundation work,” she warns. Even if the next generation lacks the right stuff to serve as foundation stewards, the door can be left open for future family involvement. Matush says one of her client families hopes philanthropic values not shared by their children might someday resonate with their grandchildren. The parents appointed trustees to manage the foundation and are creating videos explaining the family values. 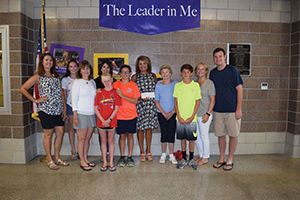 The foundation established a matching gifts program for the children and grandchildren. If any of them later show charitable inclinations, the trustees are tasked to nurture those interests and possibly create a place for the family members on the foundation board. Inclusion of the next generation doesn’t necessarily mean they will have a voice. “If Mom and Dad make all the decisions in the business, chances are they will in the foundation, even if it’s supposed to be equal,” says Matush. That’s not necessarily a negative thing — as long as the decision-making process is clearly understood and everyone accepts the situation, she says. At the Root Family Foundation, “I feel strongly about using my experience to help develop the fourth and fifth generation,” Preston Root says. Today, four G4s and three G5s serve on the foundation’s board; their ages range from 26 to 64. Board terms are three years and re-election is encouraged, which means most directors serve for six years. They are asked to stay active one year past their term to help phase in new board members. Should a family member want to get involved when there’s no open board seat, Root says the person would most likely be given an informal “internship” of about one year, to gauge his or her commitment. After that, chances are the board would vote to expand so as to add the family member. No members of the Root family hold paid positions with the foundation, and there are no full-time staff members. Dawn Trimble, who works for the Root family office, devotes about 15% of her time to the family foundation. The family considers her service to the foundation as service to the family, Root says. The foundation is “a colossal administrative challenge,” in Root’s words. Since its funding expanded after the death of his mother, the workload has increased, and volunteers are needed to get it done, he says. At the Tracy Family Foundation, family members in the first, second, third and fourth generations are involved in a variety of capacities. The Tracys are a big family; Robert and Dorothy (“Dot”) Tracy, who founded the business, had 12 children, and there are 47 members of the third generation. “We recognize that as we go through many different life stages — whether in school, college, getting married, raising a family or with different work obligations — different family members have different [blocks of] time they can commit,” Lauren Tracy says. Many family members are involved in the foundation but not the family business. For instance, one of Tracy’s third-generation cousins has worked in education, so her perspective is helpful in evaluating funding proposals related to that field. 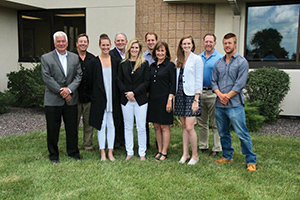 The Tracy Family Foundation has 10 directors as well as a separate next-generation advisory board, which has eight members. The board meets quarterly for a full day, with conference calls between meetings. Currently, three G2 members and five G3 members serve on the board. Jean Buckley, Lauren Tracy’s aunt, serves as foundation president, a paid position. Two board seats are reserved for non-family directors. Terms are staggered so the entire board doesn’t turn over at once. Most directors serve three-year terms, which are renewable. Two of the five G3 members are serving a one-year term, which enables them to gain board experience without a long-term commitment. Although these two directors have a shorter term of office, they have full voting rights, Tracy notes. The foundation has multiple committees, including one dedicated to each of the four focus areas. Committee chairs report to the board but need not be board members. Non-family member Dan Teefey was recently hired as the foundation’s executive director. In addition to Buckley and Teefey, there are two other paid staffers, neither of whom is a family member: program manager Terry Jenkins and executive assistant and grants manager Kim Bielik. The foundation has developed ways to engage even very young family members, Tracy says. Members up to age 30 may participate in the Next Generation Grant Program. Each next-generation participant researches a community non-profit organization that he or she would like to support. After completing the research, which includes a site visit, the next-generation members submit a grant request. The youngest participant in this program (with help from her parents) is 6 years old; she’s the first G4 member to be involved in the family foundation. Another initiative, called the Family Member Invitation Grant Program, is geared toward relatives living outside the Illinois region where the foundation is based. These family members may invite one organization in the area where they are currently living to submit a formal grant request to the foundation. The foundation also offers a matching grant program that is open to all family members age 16 and older. “Once family members get exposed to our board, it stokes the fire of giving, and they go out from there and seek opportunities in their own community to participate,” Tracy says. Occasionally there are disagreements about what should be funded, but having clearly established focus areas helps the board reach consensus, Tracy says. Matush points out that intergenerational values conflicts can lead to disputes over funding in some family foundations. For example, the founding generation might be religious and politically conservative, while their grandchildren might espouse liberal causes. In such cases, she suggests, foundation board members should determine the organization’s top priorities. Can the decision criteria be adjusted so all generations can buy into the process? Sometimes conflicts cannot be resolved. Matush recalls one client family whose foundation split into three separate entities so each generation could support its preferred causes. “If the family can admit it’s just going through the motions and they’re there because they have to be, but none are really engaged in making a difference with the resources, it’s not wrong to say, ‘This is not accomplishing what it was meant to,’ ” Matush says. Other foundations have dissolved by spending down their assets. Doing so in way that makes a major impact helps alleviate feelings of disappointment or bitterness. “It can be a nice final sign-off,” Matush says. Hedda T. Schupak is a business writer based in the Philadelphia area.